Just as a single color can have conflicting associations between different cultures, mental models can vary widely between users. If you haven’t heard of mental models, they are a beholder’s mental image of a designed object and how it may be interfaced with. Understanding the mental models your users have created of your product (or similar product experiences) is important. It will help you improve either by adjusting the product to better fit their mental model or by changing the users’ mental model to better fit your product. Neither are simple. The object is placed before you. The first thing you notice is its size and shape. It’s small enough to fit in the palm of your hand, thin, and rectangular in shape. Its color is off-white. In this first glance you might make some general assumptions about the object’s nature and function, but given that there are countless objects that could share these qualities, your observation continues. On the grey rectangle you can clearly see a small red button, a small green button, a large square button, and a series of small grey buttons in a familiar 3x3 grid. 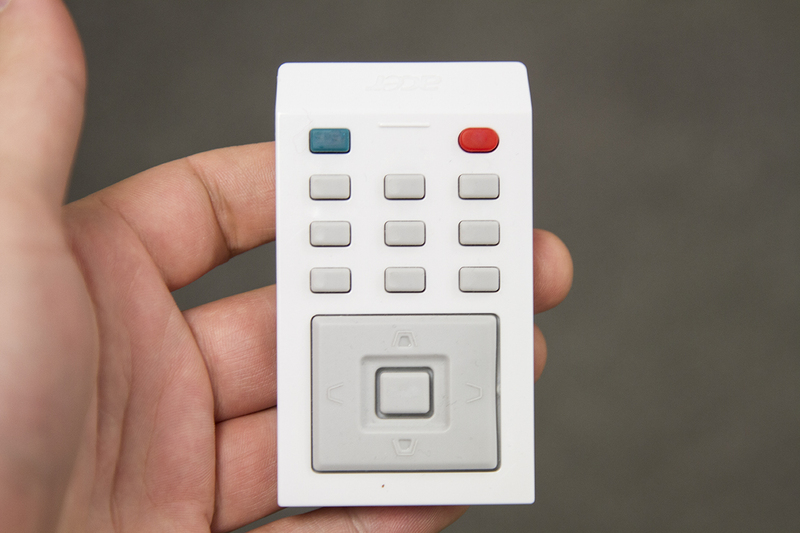 Given that the device is small enough to fit in your hand, has multiple buttons, and lacks a screen, you might conclude that it’s a remote of some kind. And you might stop there, unless you actually have to use the remote. While making these observations, your brain was building a mental model of how to interact with it by referencing past experiences with similar objects. Taking the path of least resistance, your brain wants to reapply these models wherever and whenever it can. You won’t need to re-teach yourself how to use something you’ve consistently used over the years unless something significantly breaks the pattern. With each connection you make with familiar and unfamiliar qualities of the object, either consciously or not, you pave ways to interpret the purpose, value, and effectiveness of the object. The speed with which we identify these things correlates to how similar the object is in form to other objects we’re familiar with. The models you create as a user aren’t originating solely with the object in front you; instead they are created from all the objects you’ve ever interacted with. This is where understanding and employing mental models gains value in design. We can use them to manipulate, speed up, or slow down interpretation of our products. The information and interpretations from that first glance are all gleaned with relatively low effort, almost instantaneous, and you’re not always aware that you are making these evaluations. However, a unique object often takes a conscious effort to understand. If the object wasn’t very well designed to reveal its own function you may instead have exhausted yourself with a seemingly uninterpretable thing and given up. We sometimes borrow mental models from unrelated or contextually irrelevant experiences because some aspect of what we are interacting with may have unconsciously reminded us of previous experiences. A thing isn’t always what we think it is. Because we are all somewhat responsible for building our own mental models from our experiences with the designed world, our interpretations of an object’s purpose or quality of performance can vary greatly. I think this is part of the reason why reviews of products are so polarized. People’s expectations and preferences are different, and sometimes they just aren’t able to build a fitting mental model of the product. So they’ll borrow it. If the object is truly unique, layers of mystery may remain for a broad user base. Thus, there may be limits to how they have evaluated the object’s purpose. As designers, we don’t need to hold ourselves responsible for explaining everything, but it is important to get a user to as complete an understanding as possible using the object’s form alone. No language, no manuals, no tutorials. No automatically playing videos after they log in for the first time. Going against the grain of a mental model is generally a bad idea, but it can be valuable. It should be by design, of course, and might provide some comparative market value and interest. An example of this working was the introduction of the iPod and its very unique interface (the wheel) while competitors had basically indistinguishable and boring (by comparison) arrow key pads. The iPod might have been a little more difficult to use, but the innovative design wasn’t enough of a challenge to stop people from using it. Instead the change helped Apple greatly differentiate their product from other MP3 players. What happens when you go against the grain for no good reason? Lots of avoidable and silly mistakes, that’s what. Take this remote for our projector as an example. For emphasis, I’ve erased the small labels generally ignored by users when turning the projector on or off. We know it’s a remote at first glance because we’ve used them before. The shape seems to suggest both purpose and a direction for use. Which end of the remote would you point toward the projector? If you said you’d point it with the slanted side forward and the red button in the upper right, you would have found on your first (and second, and third) attempt that this remote’s form does not align with your mental model. With this particular design, you are expected to hold the remote with the red button positioned on the bottom left. In other words, the mental model I have for remotes is not matched to the device because the manufacturer ignored a common design pattern without apparent reason, adding only momentary confusion, rather than enhanced functionality, to my experience. When designing your product, be aware of your users’ mental models and recognize that your own will be very different from theirs. This is an overwhelmingly common mistake. You should also be aware of user and market contexts to judge what aspects of their models you may break and which you should keep. Don’t break the model just to be different if the difference provides no value or delightful experience for a user. Lastly, designers must understand that users will have wildly varying points of reference, so presumed models need to be tested with multiple different users before the direction of the product design is settled upon. Failure to do this will put the success of the product at risk.